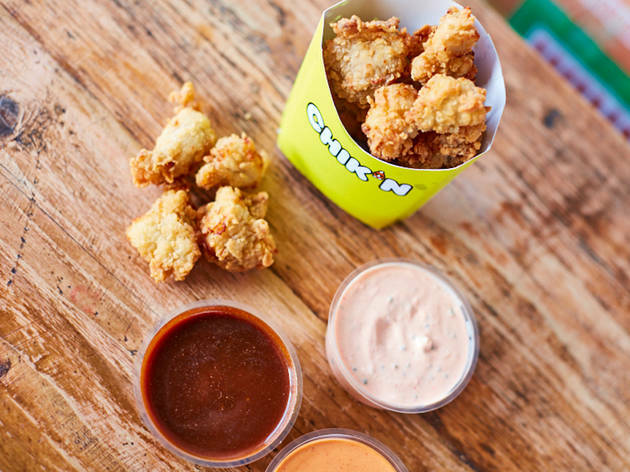 A chicken shop from the people behind Chick ’n’ Sours. 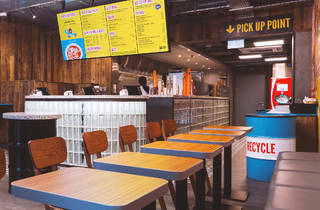 Not your average chicken shop, this colourful 25-seater spot on Baker Street is the first fast-casual offshoot of Chick ’n’ Sours. You know, the restaurant that changed the image of London fried chicken for ever with its insanely delicious KFC (that’s Korean Fried Chicken, for the uninitiated). Yes, Chik’n has counter service and upwards of one teenager in the queue, but don’t be fooled. At this fast food joint, there’s blue cheese in the 20p dip and the chickens have led happy lives on a farm in Somerset. Sadly, though, the food at Chik’n doesn’t live up to the hype. I’ll start with the good stuff. Straight Up Chik’n was solid: crisp-battered bird topped with a sloppy, sweet pickle, for less than a fiver. Not So Chik’n, the veggie option (£5.45), was also impressive: juicy, generous and ‘meaty’. But the rest? 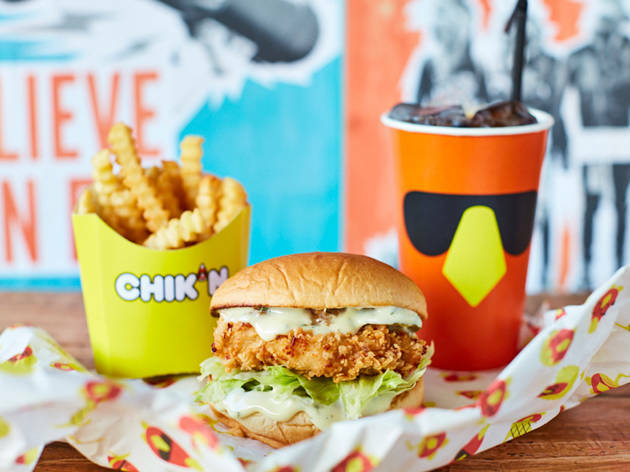 The Chik’n Hot burger is surely trying to be the fast(er)-food equivalent of Chick ’n’ Sours co-founder Carl Clarke’s famous K-Pop. But where that was a four-inch-thick masterpiece of double-fried bird, gochujang mayo, kimchi and fire, this was just an average chicken sandwich topped with a one-note ‘spicy’ slaw. Yes, the K-Pop is twice the price, but still… You just don’t expect something so uninspiring to come out of a place with this pedigree. Then there were the extremely dry cheesy fries, too-sweet milkshakes and insipid Chik’n slaw (the same slaw that ruined my burger, just in a box). Don’t let that put you off completely: if you order carefully, you’ll have a good time. Plus Chik’n is a fun place – the music is great and loud, and there’s excellent wallpaper in the loos. Just lower your expectations a bit. Tip: there isn’t a lot of seating space so make sure you get in early or get take away. Good For: cheap and cheerful, quick meal, take away, small groups. 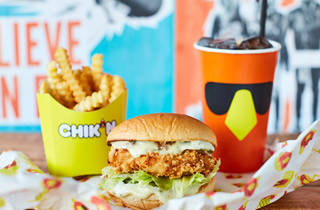 Straddling that divide between KFC and Chick'n'Sours, Chik'n is focussed on providing fast food but with high quality and free range chicken. The price point is somewhere in between as well, with burgers costing around £6/7 and sides £2 to £4. A huge fan of Chick'n'Sours, Chik'n didn't quite live up to the hype for me. Possibly because it's been all over IG this year, but part of me found myself craving the taste/flavour from a KFC wing or tender. A bit more seasoning and I think this would be spot on, but I find it hard to reconcile the taste with the price/quality of the ingredients. As in, all the individual parts are great, but together, I found it a little lacking. The reason I give it 4 stars though is because it's still VERY good fried chicken, and considering it is free range, is fantastically priced. If I could just get over my KFC hang up on flavour, I would've given it 5! 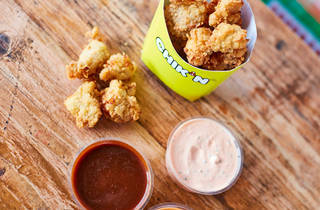 This is a big win for fried chicken everywhere - Chik'n have really nailed it. After initially struggling a bit to plant their feet in the Baker Street food scene, they've come back with a bang, and the fact that the menu has reduced in size is definitely the right decision. The chicken is just amazing. Taking a wild guess, they didn't fry the chicken on the spot and yet my cheese and chicken burger was a piece of heaven. An incredibly crispy, sweet-ish coating slapped with some cheese and bacon in a soft, almost McDonald's-like bun with delicious mayo and just the right amount of iceberg - this is done right. Even the non-seasoned chips were a win, maybe it's something about being crinkly (I also got in my pile the longest single chip I've ever seen, so that was pretty special). Staff is friendly, take-out orders are fast and efficient, and the tunes are also bangin'. What I need is more seating space so we can come here for Friday lunch. But otherwise, dear beloved Chik'n, please don't ever change. This is not just a chicken shop, they inject their day to day operations with a hint of fun. The staff here really make Chik'n what it is, they are always on hand to offer you help or explain anything on the menu. I would suggest keeping an eye on their instagram as they often have a wheel you can spin to get some free chicken or even win a holiday! The food here is delicious and the chicken is always amazing. I would always suggest trying their specials as they are tried and tested by the team and are some of the most ridiculous but amazing chicken sandwich creations. So you get the point by now. Their breakfast menu is worth the gossip. However, their chicken wings are not the best. No no no .... The coating isn't right at all and it lacks seasoning and flavour which is a crying shame but I guess you can't have it all. I am a big fan of Chick n Sour. I was in the area so had to pop by to their little sibling a taste. The food there is more of a fast food style, so don't expect the fried chicken sandwich to be like Chick n Sour. You can taste the difference. Chicken clusters and nacho fries were on point! New fast food joint on Baker Street selling a variety of fried chicken. 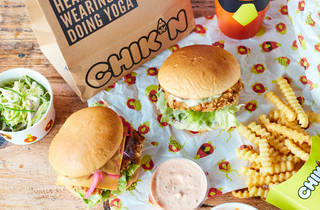 With collaboration from Chicken and Sours these guys have brought friendly fast food to London. The chicken is free range and sourced from farm in Somerset, so it tastes fresh and is so juicy. Best of all the prices aren't too bad either. There is a good range of options on the menu with a variety of burgers, nuggets, wings and tenders. They also do breakfast including hot cakes or pancakes as we know them. For drinks they have shakes, coffee and a coke freestyle machine and they even have beer. It's a winner as far as I'm concerned. Baker Street has just hatched a brand new little chicken restaurant and it's clucking cute! The branding is fresh and funky and the staff are friendly and upbeat. I grabbed some colleagues and we went there for lunch. It was crazy busy but the service was still with a smile, albeit a bit confused at times, but somehow amongst trying to feed hundreds of people they still made time to come outside, chat to people in the queue, and see if we were enjoying our food. I like that. The menu is simple but inventive with things like nacho style chips, chicken wedge salad with blue cheese sauce, spicy coleslaw, and on the sweet, side strawberry meringue or salted caramel popcorn milkshakes. Their unlimited soft drinks vending machine is the stuff that fizzy-drinks dreams are made of! Any flavour you can think of is in there on tap. Unfortunately the food didn't live up to the great service and restaurant. I found my chicken salad, for £6.45, quite expensive considering it was only really iceberg lettuce, some bacon and 2 strips of chicken. The chicken BBQ burgers were good but not much different in taste and size to a KFC, although I'm sure the quality of chicken is better. The cheesy chips were okay. They have an interesting breakfast menu that I'd like to try, and apparently their milkshakes are amazing, so although I didn't think our lunch was all it was 'cracked up' to be, I'll probably go back and try something different. If the initial excitement and great service lasts people will definitely keep flocking back for more! 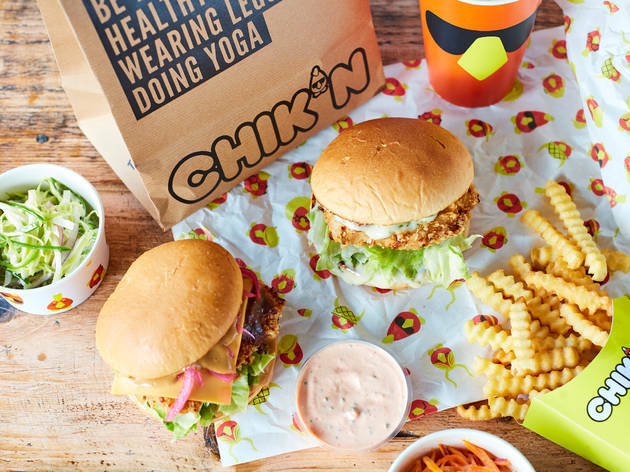 Brought to you by the same people behind Chick 'n' Sours, Chik'n is a fast casual restaurant with goals encompassing ethics, quality and sustainability. We tried this out during its opening week. Service was a tad slow as staff were still finding their way and the 50% discount drew huge crowds. The restaurant design was funky and made a change to the other casual restaurants in the street. The shakes were good as was the chopped chik'n wedge salad. The sticky wings were fine, however, the naked wings were tasteless. The Rapeseed oil used for the frying made the meal slightly healthier than the standard fried chicken. 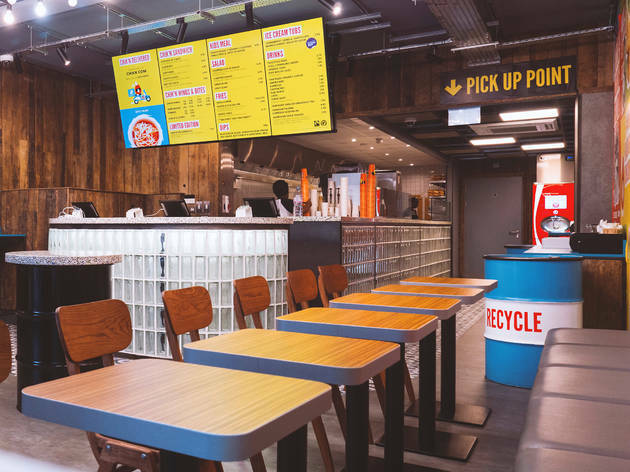 The fryers apparently used 40% less oil whilst a proportion of waste material would be converted to bio-gas, adding weight to their environmental sustainability credentials. As for the chicken itself, these were free range and sourced from Somerset.